But in addition to charity and generosity, fine cigars, food, and drink are featured. Like many cigar events, attendees are given a card with the names of all the cigar makers in attendance, who then punch the card when you pick up your cigar from their table. The result is a lot of cigars. Some were new releases: Fratello, La Gloria Serie R Black, CLE Plus, Drew Estate’s Nica Rustica, just to name a few, all of which I’m looking forward to. But I actually enjoyed some of the other cigars more. It isn’t that they are necessarily better, but these are cigars I don’t normally smoke because, writing for Stogie Guys, I tend to spend a lot of my smoking time trying the latest releases. I can’t remember the last time I smoked a regular old Padrón Maduro, but lighting one up the next day I was reminded what an excellent cigar it is, especially given the price. It’s a cigar that was a staple in my rotation when I first got into cigars, but now I maybe smoke one a year. 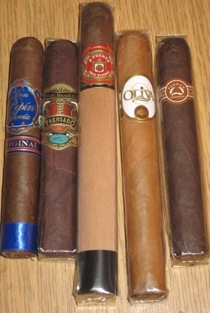 The same goes for the Don Pepin Garcia Blue, La Flor Dominicana Cameroon Cabinet, Tatuaje Regios Reserva, Alec Bradley Prensado, Fuente Chateau Sun Grown, Oliva Connecticut, and La Aroma de Cuba (original blend). Cigars I don’t frequently light up, even though each is well made and quite good. It’s a reminder not to get too focused on the latest and greatest. You’re not buying a smartphone where technology becomes quickly out of date. It’s more like music. Sure there’s some good music coming out today; but sometimes it’s better to tune into the classic rock station for dependable favorites that remind you of good times from the past. I couldn't agree more. There is something to be said for consistency, and companies like Padron, Fuente, and My Father all make reliably delicious smokes. Punch Elites, Romeo y Julieta 1875 Cedro Deluxe #2 are some old friends of mine.